Move into your future full of confidence for a healthier and happier you. Learn to live more creatively and intuitively, by responding to subtler cues from your body and your environment. Thanks to all who attended our "5 Secrets to Weight Loss" workshop yesterday. Next workshop--Saturday, February 4. Achieving and maintaining a healthy weight is a lot easier when you know about some common pitfalls, misconceptions, and most importantly, what works. About two years ago I lost 35#, but was stuck on the remaining 10 and was constantly struggling with gaining back the lost weight. But when I learned about how important cleansing was to weight management--because fat accumulates around stored toxins--I started looking around for a good cleansing program (there are lots of options!). I try to avoid obvious sources of toxins (such as in food, water, air, and personal care and cleaning products), but since we're exposed to 82,500 different toxins in a week, it's safe to assume at least some are getting through! All while not feeling hungry, not starving myself, and having plenty of energy. Best of all, my legs feel super light and springy when I'm running! Wish me luck as I continue on toward my goal of a healthy 22-25% body fat! We are proud providers of New Health Centers. To schedule your Massage Package with Pain Evaluation, please call 206-409-9447. We look forward to helping you feel better fast! A word or two from happy clients. This is to let you know that on Friday, as I started to walk Jack, our dog, I was trying to assess my level of pain. I thought it was a bit less and that the quality of it had changed. I was so preoccupied with this that I was 1/4 way through the walk when I realized my facial muscles were relaxed--I was not gritting my teeth nor grimacing with every step. I realized I could smile easily. Also, I was not swinging my leg to the side in a stiff-legged limp. Although I had a mild limp, it was nothing like it had been before your treatment. I made the entire walk, whereas the day before I did about 3/4 before quitting due to the pain. I'm celebrating the greatly increased range of motion! Yay! I feel a general sense of control with my body because I am more in touch with what it needs when I experience stress. Dr. Amundson's work has been of immense help to me for many years. I am grateful for her sensitivity and awareness as well as for her expert knowledge and skill. My weekly visits to her office are an essential contribution to my health. Dr. Connie is a true healer! You can feel healing energy emanate from her wonderful hands in every touch. She also listens deeply and that makes communicating with her so wonderful. Dr. Connie always makes me feel safe and cared for. Currently, I see her once a week for health maintenance, but she is also invaluable in a healing crisis, whether that be from a car accident, to help recover from other types of illnesses or simply throwing your back out due to too much gardening! She is so well versed and I love how Dr. Connie uses a plethora of healing modalities, customizing care just for me. She has my complete trust! Dr. Amundson has a knowledge of human physiology that I've yet to see matched. While her Network Care is well-nigh miraculous, I find her advice about everything from ergonomics to nutrition to be equally invaluable. One could not ask for a better or more complete package in a chiropractor. My lower back has never felt so good! Connie has really helped with the neck pain I was experiencing and also increased the flexibility of my spine. Her breadth of technique that complements the basic Network Care approach has been very effective for me. I would recommend her highly (I have been to 9 or 10 other Network chiropractors since giving up on conventional chiropractic practitioners). I have known Connie Amundson for over 30 years and have watched her grow as a healer and a person. We met when we were both studying the Alexander Technique with Marj Barstow in Lincoln, Nebraska. We connected again when she moved to Seattle in 1977. We worked and played together in theatre and in Aikido, but her interest in health and well-being eventually led her to a career in the healing arts, with chiropractic as her basis. Connie has been my chiropractor for nearly 25 years. What I appreciate most about her work is her openness and willingness to learn new approaches and techniques, her empathy and her ability to clearly connect with each of her clients. She is flexible in her approach, and partners with you to improve your health and life. I can honestly say that my health, coordination and enjoyment of life are better for having known and worked with Connie all these years. When I first started seeing Dr. Connie Amundson, I had been abused by the medical system, being told that I had incurable conditions that could only be treated with large numbers of prescription drugs. However, the treatments I was getting from traditional medicine only made my conditions worse. I had lost a lot of hope, but was still determined to find alternative solutions. Working with Dr. Connie has changed my life in so many ways. I have hope once more, and I am able to do things I thought I would never be able to do again. The work with Connie helped me to get my spirit back. I feel like the improvements made have gone beyond physical changes, to also include spiritual and emotional growth. People have said that they can see a change in me, my eyes are alive again. I now have a much healthier lifestyle and have seen a great deal of improvement in my pre-existing conditions. I know that I still have more growth ahead of me, but I feel the work has enabled me to make healthier choices in all aspects of my life. One of the highest compliments that I can give to Connie is that she truly has the spirit of a caregiver. As a client of Connie's, I have felt nothing but compassion and caring from her as a practitioner. After being treated horribly by many practitioners in the healing professions, it was truly a gift to have the chance to work with Connie. She never blamed the person in pain for their circumstances and always encouraged the client to see healing as a process. She invests in her clients, and that compassion show in her work, and I for one have definitely been able to reap the benefits. I've been a chiropractor in Seattle, Washington, for over 25 years. During that time I have been blessed with the opportunity to serve the wellness needs of thousands of patients, as we have grown and explored the possibilities of optimum wellness together. It is my patients who lead me to continually expand what hands-on work can accomplish for all levels of body, mind and spirit. As a complement to my chiropractic practice, I recommend and promote health products that I find to meet high standards of quality and value. My outside interests range from eating organic, local food to creating works of ritual theater, from downhill skiing to going to the movies, and from walking with friends to Sunday morning coffee/tea with John and a newspaper. I grew up on a dairy farm in Minnesota, ventured to Minneapolis/St. Paul, Lincoln, Nebraska, and New York, New York before settling in Seattle with my husband, John Kanetomi. 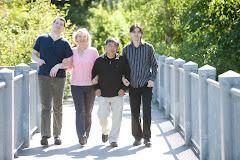 We have two sons, ages 23 and 18; the older teaches Aikido with John, and the younger attends the Foster School of Business at the University of Washington. What happens when we're sedentary? Groupon Daily Deal Coming Soon!